Becky and Matt said “Yes!” to forever on November 10, 2018. While their ceremony was scheduled elsewhere, they prepared for the big day with their wedding party at the Seibels House. Hairstyles by Lauren gave Becky an elegant updo, while Casie B. provided stunningly classic makeup services. Holly Graciano was present all day to capture gorgeous photos during the first flush of morning. Then, it was time to head to the church! The new Mr. and Mrs. Morrison held a stunning ceremony at the Basilica of Saint Peter, where they exchanged sentimental vows and committed to each other forever. Matt looked striking in his tuxedo from Britton’s, while Becky brightened the room in her dress from Morilee at Bridals by Jodi. Her colorful bouquet by Molly Brantley perfectly complimenting her gown and the bridesmaids’ mulberry dresses from BHLDN. After sealing forever with a kiss, everyone prepared to head back to the Seibels House & Garden for the reception! Lively flowers, colorful fruits and beautiful café lights adorned the reception venue. Party Reflections and La Tavola Fine Linens decorated the space in bright, fresh colors. 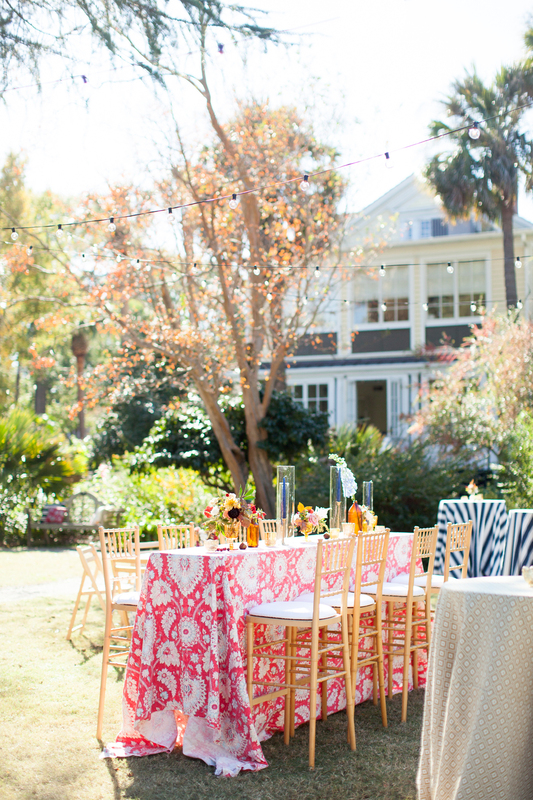 The alternating linens and patterns throughout the venue created a fun and airy feel. The illumination in the garden was provided by Ambient Media, who used a special rig, created just for the Seibels House’s reception garden! The fruit and cheese trays were a delicious addition to the night. Capital City Catering provided the fresh grapes, pineapples and other fruits along with a variety of cheeses for a light snack. The blissful guests had delicious cocktails to toast to the newlyweds from Ed’s Bartending. Everyone danced the night away to an amazing live band, Prettier than Matt, Guests even enjoyed a live painting by Megan Carn! It was a very exciting and cheerful night for everyone in attendance. The night ended with the couple cutting a tasteful four-layer cake from Bonnie Brunt. The couple was sent off for their historically ever after in transportation by Southern Valet. It was a night to remember and cherish forever! The newlyweds couldn’t have dreamed of a better execution of the day and are extremely thankful for Meagan Warren Weddings. See below for a list of all the awesome vendors present. Makeup: Makeup by Casey B. Please call Brittany at 803.252.7742 x 11 or visit our rentals page for more information.